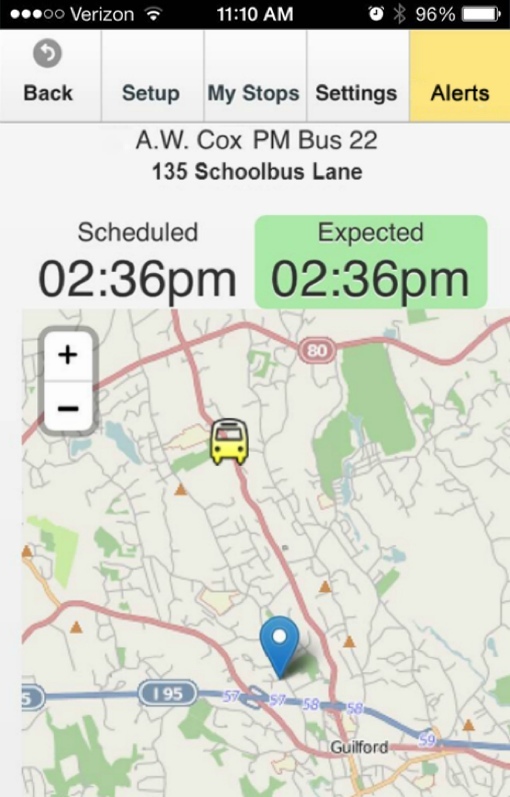 The companion SafeStop school bus app. This past weekend, student transportation company SchoolWheels Direct unveiled a new futuristic fleet yellow school buses that come fully equipped with WiFi, GPS, and a network of cameras. The tech isn’t there just for the benefit of students – it’s there to give parents piece of mind. Each bus is linked to a companion smartphone app called SafeStop (shown). Parents can use the app to track the location of the bus in real-time and get alerts if the bus is running early or late. SchoolWheels Direct's fleet of buses are aimed at serving private school students and parents who choose to contract it for their children. A year of ridership costs between $800 and $1,200, depending on the route. Public school students aren't being left out when it comes to bus tech, though. A competing child tracking system called Zonar is being installed on a number of public school bus fleets this year. It tracks students by use of RFID chips to ensure that no kids get left behind on the bus. It also offers GPS-based tracking and lateness notifications to parents. For more on schools, technology and your kids, check out our current Back to School coverage.